As the days grow shorter, the air feels brisker, and the leaves begin to turn, residents of cold-weather climes start to think about the toll snow, ice and freezing temperatures can take on their houses. Now is the time to protect and winterize your home. 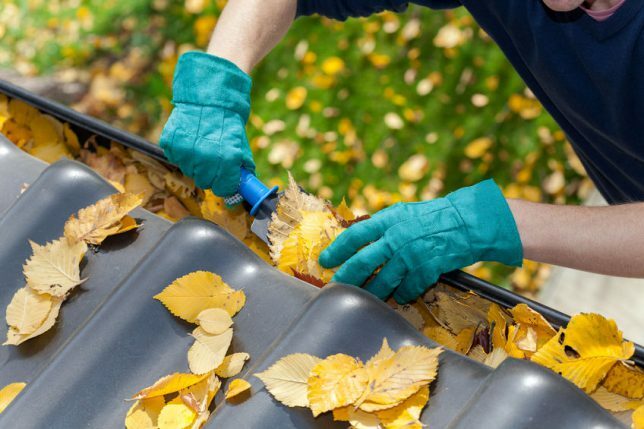 Clean gutters: Clear leaves and debris from your gutters to make sure water can flow freely away from your home. This will help prevent icicles and ice dams from forming. Clogged gutters can lead to frozen pipes, water intrusion that damages interior walls and ceilings, and eventually the growth of mold. Flush your water heater: A water heater’s efficiency can be reduced by sediment that builds up at the bottom over time. Flush water through the drain valve to release particles and keep the water heater functioning properly. Insulate the tank with a pre-cut jacket or blanket to reduce heat loss. Deep clean: When your home is closed up tight during winter months, the presence of dust, pet dander, and dirt can decrease indoor air quality. Give your home a top-to-bottom fall cleaning to reduce these allergens. Rotate ceiling fans clockwise: When ceiling fans rotate clockwise, they will push hot air from the ceiling to the floor, making your home feel warmer. Replace air filters and clean air ducts: Help your central air and heating system work efficiently by regularly replacing air filters and by having air ducts cleaned. This will also help lower your heating bill. This is a good time to schedule a seasonal maintenance check of your system. Caulk gaps: Search for gaps in siding, windows and doors and fill them with caulk to provide insulation. Provide extra protection from drafts by removing interior molding around windows and doors and applying caulk. Add insulation: Filling in with fiberglass insulation around basement and attic windows and doors, and the attic floor and basement ceiling, will improve heat retention. Check windows and doors: Air leaks and drafts around windows and doors can be minimized by using weather stripping to seal them tightly. This will also make your home more energy efficient. Applying window insulation film can keep heat from leaking out of windows. Draft guards or even rolled-up towels placed at the bottom of exterior doors will help keep warm air in and cold air out. For more tips on saving energy during cold weather, check out the advice of the U.S. Energy Department on Energy.gov. Secure chimney: Chimneys are a source of heat loss. If you don’t plan to use your fireplace, a chimney balloon will plug it, keeping drafts from blowing down and heat from escaping. Shut off exterior faucets: Draining and disconnecting hoses and blowing out sprinkler systems will help prevent frozen water lines and burst pipes. Check for leaks and insulate outdoor pipes. Need repairs to prepare for winter? Hire a pro. Regular maintenance is the key to keeping your home in shape for every season, but it’s important not to put off needed repairs that can make your home safer, more energy-efficient, and more attractive. For best results, hire a contractor to do the work. Finding one near you is easy: just enter your ZIP code above and we’ll match you to a prequalified contractor whose workmanship is warrantied for a full three years. You’ll receive a free, no-obligation estimate from a contractor with the licensing, insurance, and experience to do the job right.